Apparel remains one of the key battleground categories in retail today, and like in most other product categories, Amazon has made significant in-roads here. Beyond expanding the range of product offerings and brands in its marketplace, Amazon has also launched several private label brands in this vertical and looked to drive more sales as a first-party seller. Recently, DataWeave collaborated with Coresight Research, formerly known as Fung Global Retail & Technology, a retail-focused research arm of Li & Fung Group, to publish an in-depth report revealing Amazon’s strategic approach to product assortment in its fashion and apparel category. Our analysis focused on several critical areas, including the presence of Amazon’s private label, the demarcation between Amazon as a seller and its third-party sellers and the top brands and categories in women and men’s apparel. Firstly, we identified brands with a meaningful presence in Amazon’s clothing offering by identifying all brands included in the top 500 ranks of featured product listings for each product type in the Women’s Clothing and Men’s Clothing sections on Amazon (e.g., the Top 500 product listings for women’s tops and tees, the Top 500 product listings for men’s activewear, and so on.). This generated a total of 2,798 unique brands. Secondly, we aggregated our data on all product listings within the Women’s Clothing and Men’s Clothing sections for each of the 2,798 brands identified previously. This returned a total of 881,269 individually listed products. This extensive list forms the basis for the highlights in Coresight’s report. Strategically, Amazon remains heavily reliant on its third-party sellers in the clothing category. In total, just 13.7 percent of women’s and men’s clothing products featured on Amazon Fashion are listed for sale by Amazon itself (first-party sales), while third-party sellers account for 86.3 percent of listings. In womenswear, third-party sellers account for 85.7 percent of listings, while in menswear, they account for 87.1 percent of listings. Moreover, Amazon appears to be focusing its first-party clothing inventory on the higher-value categories. Clearly, the retailer’s reliance on third-party sellers underscores its opportunity to grow its sales of apparel volumes by bringing more of its current inventory in-house. The analysis found 834 Amazon private-label products on Amazon website, equivalent to 0.1 percent of all clothing available through Amazon Fashion. The company’s private labels appear to be clustered tightly in specific clothing categories. Womenswear brand Lark & Ro is by far the biggest of Amazon’s apparel private labels, as measured by the number of items. 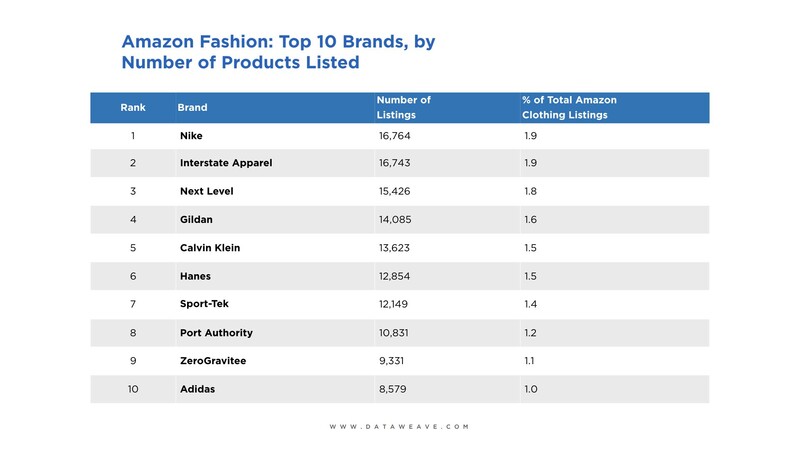 Nike is the most-listed brand on Amazon Fashion, with 16,764 listed products spanning womenswear and menswear. Lower-price brands such as Gildan and Hanes also rank very highly in terms of the number of products listed. Value-positioned brands that have traditionally focused on wholesaling to retailers, such as Gildan and Hanes, also rank very highly in terms of the number of products listed. What is clear is that currently, Amazon’s clothing listings are highly diluted, with no one major brand dominating the listings. Interestingly, casualwear and activewear clearly lead Amazon’s category rankings. Women’s tops and tees are the most heavily listed clothing category on Amazon Fashion, with 138,001 products listed. Men’s shirts, which includes a large number of casual shirts together with polo shirts and some T-shirts, comes in second, with 109,043 products listed. Echoing the prominence of the global Nike and Adidas brands on the Amazon website, activewear has achieved a centre of gravity status as a category, accounting for 76,930 men’s activewear products and 51,992 women’s activewear products listed on the site. Amazon Fashion remains heavily dependent on third-party sellers. It’s a fair assumption that more first-party listings would attract greater numbers of shoppers, especially Amazon Prime members. Amazon’s private-label ranges represent another potential lever for growth. Also, the 30 most-listed brands on Amazon Fashion comprise 30 percent of all clothing products listed on the website, while just 189 brands have more than 1,000 products each listed on the website. This data indicates the presence of major growth opportunities across the board, be it Amazon private label brands, Amazon as a seller, and for several mid-range clothing brands. If you’re interested in DataWeave’s technology, and how we aggregate data from the Web to provide unique and comprehensive insights on eCommerce products and pricing, check us out on our website!